Eats & Retreats features a curated portfolio of Surin beach private luxury villas & vacation rentals to rent for individuals, couples, friends, families & large group holidays. We work directly with property owners to guarantee the best price. We also provide a book-now service with a 72 hour free cancellation period. Located with sea views in Surin beach, Phuket. 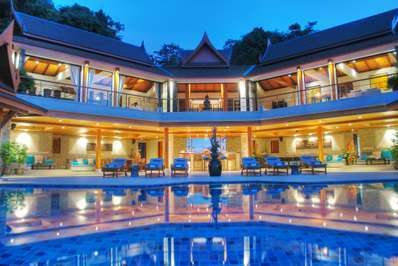 Villa Rak Tawan is a thai-style villa in Thailand. Surin beach in Phuket is known as “millionaires row” owing to the collection of celebrity homes along the beach front and on the cliffs overlooking the Andaman. It’s Phuket’s answer to Malibu, California – rich and sunny. It’s looks very pristine, with soft white sand and turquoise waters, and has managed to retain a relatively untouched feel despite its popularity with Thais and international tourists. Surin beach is full of high end villas, high end restaurants and high end wine bars. All of the accommodation is top level, so you may as well do it in style. There is a distinct lack of jet skis here, which make Surin beach a quiet place to relax, eat barbecue seafood, and enjoy the shade of casuarinas. Haad Surin Soi 8 and the beach front feature the highest concentration of restaurants. Sea food dominates as you’d expect but Soi 8 offers enough international options to keep you satisfied. For nightlife, enjoy the beach area bars, sip cocktails, relax and socialize. The atmosphere is pleasant and makes for fun idle chat. Surin Beach is located north of Patong Beach and takes roughly 5 minutes in a taxi along the beach road. From the airport, it’s about 15 minutes in a shuttle bus. The West coast of Phuket is blessed with the crystal clear waters of the Andaman Sea, part of the Indian Cocean and perhaps the world’s most beautiful aquatic offering. The sea is warm and clean, and is the stuff dreams are made of. Surin Beach was one of the locations hit by the 2005 tsunami. It has since recovered, rebuilt, and returned to its position as a leasing location for up-market, five star villas. Surin beach is an ideal place for swimming all year round. You’ll want to pass all day in its perfect blue water. 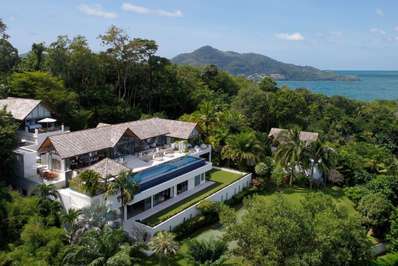 Surin Beach villas are high end and luxury. The finest properties on one of the world’s finest beaches, you’ll be one of the select few to secure a place each year.